"Contents" grid on the outer flap for quick reference. "Notes" ruling on the inside for meeting notes, details on enclosed subject matter or project completion dates. Note: A minimum quantity of 18 must be ordered, and in units of 18 thereafter. Pendaflex Printed Notes Folders with Fastener, 1/3 Cut Top Tab, Letter, Assorted, 30/Pack - Innovative file folders are ideal for organizing and customizing projects, files, correspondence and notes. 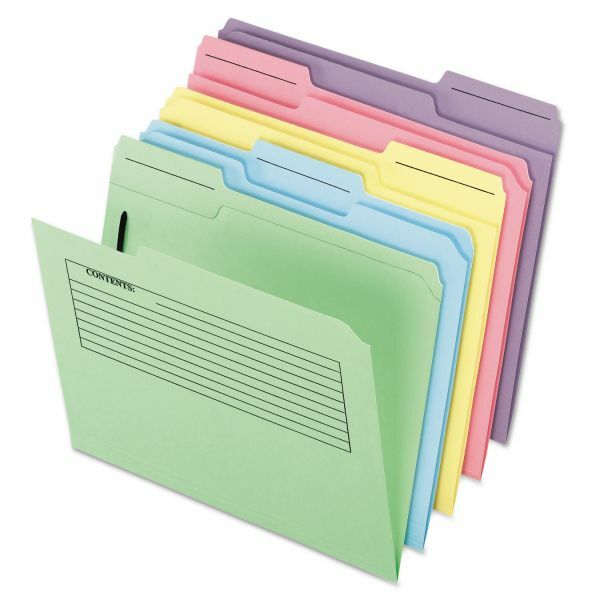 Folders contain both contents" and "notes" preprinted sections which allow you to detail and classify contents. Assorted colors include red, blue, yellow, green and violet. Great for transporting important documents and projects between offices and meetings. Fastener is designed for holding loose papers. SFI Certified.